The evidence was captured during our first investigation was inconclusive due to many outside variables. We were granted a second investigation to see if we could confirm what we caught during our first investigation. To fully understand the video clips below a history lesson is required. Specifically a lesson about "the mystery of the unknown woman". 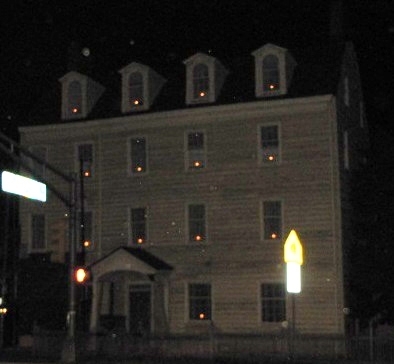 The unknown woman refers to a woman who was found murdered in Rahway in the year 1887. Her identity was never discovered and thus she was buried in the Rahway Cemetery in a grave marked with the headstone, "Unknown Woman". Al Shipley who is the director of the Merchants and Drovers Tavern Museum. Al wrote the book "The case of the Unknown Woman". Al's office is less than 300 feet from where she is buried. The video clips you see below all take place in Al's office. There was absolutely ZERO activity until we started asking questions about the Unknown Woman. In these clips we were attempting to make the connection between the woman who was murdered down the road from where Al Shipley works, a woman who he was compelled to write a book about, and a woman who is buried not far from where is spends a lot of his days. * There were many instances where we were investigating on the first or second floor and we would hear footsteps on the steps as well as on the floors above us.